On the rotating table the components are continuously passed through the blasting area. This guarantees a uniform blasting of the surface. 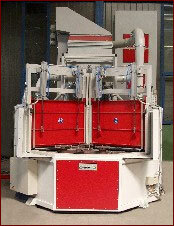 This type of machine is available as indexed and batched version. The machines can be equipped both with injection and pressure blasting system. This machine has three satellite turntable inserts (multiple table options are available on request), each with a diameter of 1000 mm, which are integrated into the main table level (diameter 2500 mm). Once on the rotary plates, the components are blasted by two high-performance Hurricane blast wheels. With the Rösler SA 1400 rotary indexing table machine, targeted, careful, non contact finishing of different kinds of components and variable capacities is possible in the same machine. 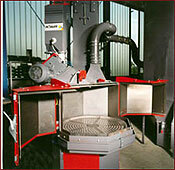 The entire spectrum of blasting applications ranges from delicate deburring up to shot peening. The installation is particularly interesting for applications in which the entire surface of the components need not be blasted, but rather only in specific places. The concept of the SA 1400 is based on a modular system and can be equipped with 6, 8, 10 or 12 satellites operated completely automatically. The machines can be equipped both with injection and pressure blasting system.